Verizon Wireless announced that its 4G LTE network build out is substantially complete. The company marked the occasion by activating service in Parkersburg, W.Va. -- the 500th market in the United Stated to get Verizon Wireless LTE service. The Verizon Wireless 4G LTE network now covers more than 99% of its 3G network. The 4G LTE network is available to 298 million people across the country – more than 95% of the U.S. population, making it the nation’s largest 4G LTE network. Verizon Wireless’ Chief Network Officer Nicola Palmer said the company's efforts will now turn to bringing more advanced services to the network, including VoLTE. The company now expects to activate VoLTE commercially in 2014. At this week's Cisco Live! event in Orlando, Florida, Cisco further outlined its data center networking architecture for the era of Application-Centric Infrastructure. The goal is an open, programmable and automated infrastructure that is ready for cloud deployment models and Big Data applications. Cisco also announced new Nexus 7700 Series switches and new F3 Series I/O modules. Cisco's Application-Centric Infrastructure architecture will cut application deployment time via fully automated and programmatic equipment. The architecture will provide integration across physical and virtual applications normalizing endpoint access while delivering flexibility of software and performance, scale and visibility of hardware across multi-vendor virtualized, bare metal, distributed scale out and cloud applications. Another design element is a common policy management framework and operational model across network, security and application teams that is extensible to compute and storage in the future. Cisco said it will support a broad ecosystem of partners empowered by a comprehensive published set of open APIs. 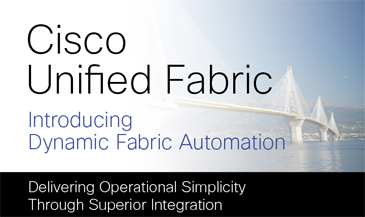 New Cisco Dynamic Fabric Automation (DFA) for the Nexus portfolio brings support for optimized spine-leaf topologies with enhanced forwarding and distributed control plane capabilities. It also delivers greater resiliency with smaller failure domains and multi-tenant scale of greater than 10,000 tenants/networks. Cisco Prime Data Center Network Manager (DCNM) 7.0 provides a single point of management automates and simplifies infrastructure deployment, enables dynamic infrastructure provisioning for virtual machine (VM) deployment and provides troubleshooting tools. Cisco Prime Network Services Controller 3.6 -- dynamically creates network services, communicates with VMware and Cisco Nexus 1000V, and passes relevant information to DCNM. New Nexus 7700 Series switches consist of environmentally efficient Nexus 7710 (10-slot) and Nexus 7718 (18-slot) chassis. New F3 series I/O modules, which are supported on both 7000 and 7700 Series switches, deliver 40G/100G density, improve power efficiency by 60%, and support a broad set of proven Data Center Switching features. These enable the Nexus 7718 to support up to 384 40-Gbps ports and 192 100-Gbps ports. The Nexus 7718 has been designed to deliver up to 83Tbps of overall switching capacity. The FCC adopted an order that opens 10 megahertz of spectrum in the bands 1915-1920 MHz and 1995-2000 MHz (H Block) for commercial mobile broadband use. The order pairs the two bands that comprise the H Block, and establishes that the paired bands will be licensed on an Economic Area basis and auctioned through a system of competitive bidding. Rules are also established to ensure that operations in the H Block do not cause harmful interference to PCS downlink operations. The FCC described the action as a step towards meeting its obligation under the Middle Class Tax Relief and Job Creation Act of 2012 (Spectrum Act) to license 65 megahertz, including the 10 megahertz in the H Block, by February 2015.
tw telecom officially launched metro 40G and 100G Business Ethernet services in its 75 metro serving areas. The faster speeds complement its current 2.5G and 10G intra-market Ethernet services. "The addition of these faster speeds will enable enterprises to more efficiently and effectively connect headquarters, remote offices and data center locations across the metro for a variety of Big Data applications," said Graham Taylor, Senior Vice President for Marketing at tw telecom. "We build our gigabit Business Ethernet services in direct, point-to-point connections so the infrastructure remains highly efficient; enabling customers to get massive transmission speeds to deploy their equipment and solution anyway they need." tw telecom is one of the top three providers of Business Ethernet throughout the U.S., according to leading industry analysts Vertical Systems Group and Frost & Sullivan. Ericsson and Sony demonstrated HD quality voice and video calling (VoLTE) using TD-LTE (VoLTE). The demonstration, which was conducted at Ericsson's Wireless Innovation Lab & Demo Center (WILD Center) in Shanghai, featured Sony’s 4G phone Xperia SP M35t smartphone, which supports TDD/FDD LTE, TD-SCDMA, HSPA and GSM over 13 bands. A connection to the Core & IMS nodes located in Ericsson’s VoLTE Competence Center in Anyang, South Korea was used for the HD voice and video calling over LTE demonstrations, using Ericsson’s end-to-end core and radio network infrastructure. 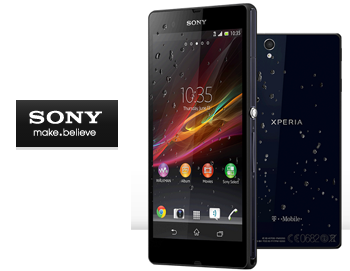 Sony's Xperia SP M35t will be commercially launched when 4G licenses are released in China. In February, Ericsson successfully supported China Mobile in demonstrating the world’s first dual-mode HD VoLTE call between TD-LTE and LTE FDD at the Mobile World Congress in Barcelona. The first Mobile User Objective System (MUOS) satellite, which will provide simultaneous voice, video and data communications to U.S. military combatants, was encapsulated into its payload fairing and is scheduled to launch July 19 aboard a United Launch Alliance Atlas V launch vehicle. The satellite was built by Lockheed Martin. The MUOS constellation replaces the legacy Ultra High Frequency (UHF) Follow-On system and delivers secure, prioritized voice and data communications, a first for mobile users who need high-speed mission data on the go. 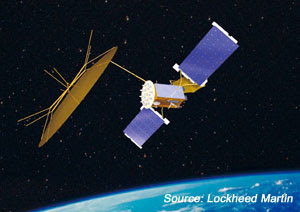 Lockheed Martin said first MUOS satellite, launched in 2012, is currently providing high quality legacy voice communications for users. More than 20,000 existing terminals are compatible with and can access the MUOS legacy UHF payload, and with the release of the new waveform developed for increased data-handling capacity, many of these terminals could be retro-fitted to access the Wideband Code Division Multiple Access (WCDMA) payload. This advanced WCDMA payload incorporates commercial technology designed to provide 16 times the number of accesses as the legacy UHF Follow-On system that it replaces. The geosynchronous constellation consists of four satellites and one on-orbit spare, which are expected to achieve full operational capability in 2015, extending UHF narrowband communications availability well past 2025. Lockheed Martin Space Systems is the MUOS prime contractor and system integrator. A single MUOS satellite will provide four times the capacity of the entire legacy UFO constellation of 10 satellites. The satellites also include a hosted legacy UHF payload that will be fully compatible with the current UFO system and legacy terminals. Claro Chile, a wholly-owned subsidiary of the América Móvil, is the first operator to launch commercial LTE service in Chile. Nokia Siemens Networks provided the LTE radio access network featuring its Flexi Multiradio 10 Base Stations. along with its Evolved Packet Core (EPC) network to help the operator deal with the unprecedented increase in data traffic over its network. Nokia Siemens Networks’ Global Services is providing network planning and optimization services, as well as operational services for process alignment, support and engineering. The contract also includes care hardware and competence development services. Financial terms were not disclosed. The Optical Internetworking Forum (OIF) has completed two critical technical whitepapers that address the increased adoption of OTN for 100G carrier networks and the use of PCE control technology as a building block towards Software Defined Networking (SDN). OTN TCM whitepaper -- provides guidelines on the use of Tandem Connection Monitoring, a way of monitoring performance on segments of an OTN connection. It focuses on guidelines for how to apply the six levels of TCM and is intended to help carriers best take advantage of the advanced monitoring functions provided by TCM. The whitepaper provides a framework that can be pre-configured into switches to further reduce administrative overhead. PCE Implementation Agreement -- defines the use of Path Computation Elements in a multi-domain ASON network, taking standards for PCE created by the IETF andidentifying subsets of the standards that can be adopted for interoperability across a multivendor, multi-domain carrier network. 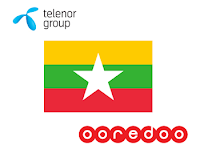 Telenor and Qtel (Ooredoo) were each awarded licenses to build mobile networks in Myanmar. Telenor said it plans to rapidly roll out a modern telecommunications network and services. Telenor plans to build a state-of-the-art mobile network using HSPA and LTE-ready technologies reaching nationwide coverage within five years. First services are expected to launch in 2014. Ooredoo noted its significant experience of developing, delivering and investing in communication services in the ASEAN region. Its assets include Indosat, the Indonesian fixed and mobile communications services provider. Through its partnership with STT, Ooredoo is also an active investor in Starhub, Singapore’s leading integrated communications provider, which offers some of the region’s most advanced communications services for consumers and business. Also through the STT partnership, Ooredoo is invested in LTC, the incumbent fixed and mobile network provider in Laos. Underpinning the importance of broadband services, Ooredoo operates wi-tribe, a broadband network provider with operations in Pakistan and the Philippines. Tele2 Norway has selected Ericsson for its nationwide LTE rollout. Ericsson will also upgrade and expand Tele2's existing 2G and 3G networks in Norway, becoming the main vendor for the radio access solutions for all standards. The deal includes multi-standard radio base station equipment from the Ericsson RBS 6000 family, LTE RAN software, upgrade of existing 2G and 3G access network software and upgrade of core solutions. Services will also be a key part of the upgrade. Financial terms were not disclosed. Ericsson signed a new USD 2 billion multi-currency revolving credit facility and refinanced its credit facility signed in 2007. The new facility has a tenor of five years, with two extension options of one year each, and the facility serves for general corporate purposes. HSBC Bank plc and Nordea acted as coordinators. Wind Telecomunicazioni has selected Alcatel-Lucent to extend and transform its nationwide fibre-optic transport and IP communication networks across Italy. Alcatel-Lucent is providing a network transformation solution that includes long-haul optical transport, mobile backhaul, metro area network (MAN) and IP service edge technology to expand and update Wind's existing network, as well as introduce advanced services to customers. 1850 Transport Service Switch to extend Wind's mobile backhaul infrastructure in support of mobile broadband services. 7750 Service Router for aggregating traffic in the metro areas and as the IP service edge for delivering advanced, high-speed residential services and business services, such as VPN over IP and Internet access. "This agreement confirms our commitment to deliver services with high efficiency and functionality to our customers, by developing the telecommunication infrastructure in Italy. The continuous evolution of our transport network is of paramount importance to our strategy, which aims to provide an effective and intelligent answer to the new phase of communications, already characterized by a real data explosion, particularly in mobility, with the objective of keeping on offering the best value/price ratio, that is what distinguishes our positioning," stated Gianluca Baini, CEO Alcatel-Lucent Italia.